Calgary Elephants Welcomed To Washington, D.C.
Kamala, Swarna, and Maharani, three elephants from the Calgary Zoo, are settling in at their new home in Washington, D.C., after a long road trip and 30 days in quarantine. In 2012, the Calgary Zoo decided it would move the trio of Asian elephants somewhere with more space and a better climate. The $56-million elephant complex at the Smithsonian’s National Zoo was chosen as their new home where they can roam more freely and join four other elephants named Ambika, Shanthi, Bozie and Kandula, the only male. The elephants were transported in huge crates aboard flatbed trucks. The convoy of vehicles drove to Quebec and then down to D.C. over the course of three days. They took breaks about every three or four hours to switch drivers and check on the animals. Their transportation and the transition process were in part made possible because of a $2-million donation from U.S. philanthropist David M. Rubenstein. Settling three elephants into a new environment is no easy task, said Colleen Baird, a curator from the Calgary Zoo who made the trip to help with the transition, but it&apos;s going smoothly so far. "They are getting used to their new home, it&apos;s taking a bit of time," she said. At first the three huddled together, but after a few days they began to separate from each other and explore on their own. Unfamiliar noises would initially startle them. New people, new food and new space for playing and socializing were a lot for the animals to absorb. Calgary Zoo staff have been showing the National Zoo staff the techniques and cues they used with the elephants. Baird said the climate in Washington is already helping the elephants. The softer ground with lush grass and sandy terrain has meant improved cuticles on their feet, and their skin is better — they have essentially been exfoliating by spreading sand on themselves. Baird said she thinks the elephants will miss Calgary’s community support and their caretakers, but they are better off in Washington. "I think they will be homesick for the staff that took care of them in Calgary, but I don&apos;t think that they&apos;re going to miss the climate in Calgary, and I think they’re really going to enjoy the bigger space they have here and the bigger herd," she said. "We can tell that the National Zoo caretakers are falling in love with these elephants, and it&apos;s only going to be a matter of time when we see those relationships bond a lot stronger," said Baird. 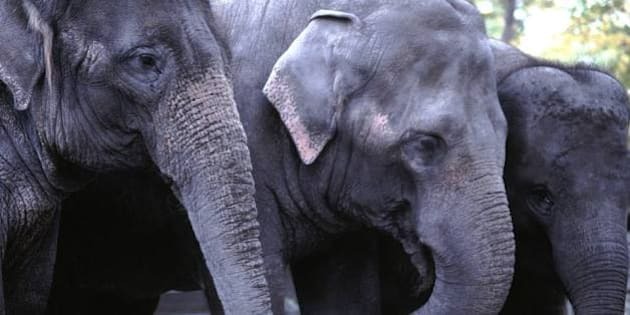 Kamala and Swarna were born in 1975 in Sri Lanka and spent time in the Pinnawala Elephant Orphanage. Two of the National Zoo&apos;s elephants, Bozie and Shanthi, were also at that orphanage at the same time. Caretakers aren&apos;t sure if they&apos;ll remember each other, but there is that old saying — elephants never forget.